Cold hydrostatic testing has been completed at unit 1 of the Shin Hanul nuclear power plant in South Korea's North Gyeongsang province, Korea Hydro & Nuclear Power (KHNP) announced today. The APR-1400 reactor is scheduled to start up in early 2018. Cold hydrostatic testing involves filling the reactor's primary circuit with water, which is circulated by the reactor coolant pumps to verify that the welds, joints, pipes and components of the reactor coolant system and associated high-pressure systems meet regulatory standards. The coolant pumps will help to maintain the reactor's internal temperature at a safe level during operations. The tests - an important step in the commissioning of new units - were carried out at high pressure, 1.25 times the design pressure of the equipment and piping. Ground breaking for the first two units at the Shin Hanul (formerly Shin Ulchin) site took place in early May 2012. First concrete for unit 1 took place in July 2012, with that for unit 2 following in June 2013. The reactor vessel of unit 1 was installed in May 2014, with that of unit 2 following in April 2015. KHNP said high temperature functional tests will be conducted at Shin Hanul 1 between May and September 2017, with fuel loading scheduled to be completed in April 2018. The Shin Hanul units are the second pair of APR-1400s to be built in Korea. 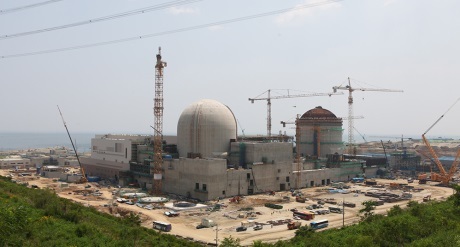 The first APR-1400 reactor, unit 3 at KHNP's Shin Kori site in South Korea, reached first criticality in December 2015 and was connected to the grid in January. A second unit, Shin Kori 4, is expected to start operating in early 2017. Two further APR-1400 units are planned for each site. Four more APR-1400s are under construction at Barakah in the United Arab Emirates. All four are scheduled to be in operation by 2020.